Although concrete is easy, cheap, and often the most cost-effective flooring option for places in the home such as the basement, at times it can be an eyesore. Fortunately, there are several outlets for revamping a tired concrete floor into something sleek, modern, and sophisticated. We have compiled here a list of five ways to cheaply cover a concrete floor in a way that doesn’t sacrifice function for a form of break the bank. Read on to discover the best floor covering for basement for you and your family. It’s important to keep in mind this process requires a freshly poured area of concrete, so it may not be suited to every project. However, if you are looking for inexpensive ways to cover concrete floor, this process can easily turn any concrete floor into a unique statement in your home or basement. The process involves a concrete “stamp” which is shaped like a tile and leaves an impression behind in the wet concrete. After staining and drying, the effect is very similar to a tiled floor. Perhaps the cheapest way to cover concrete floor is to simply buy a rug. You can cover the floor partially or entirely—the contrast between a bohemian rug and a more industrial concrete floor adds eclecticism to any space. Keep in mind the needs of your household when selecting a rug--high pile rugs can warm up space but lend themselves to dirt and pet hair. 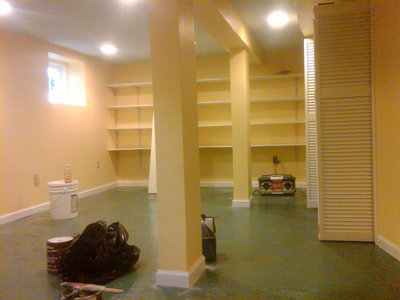 Painting over the concrete is another good choice of all the inexpensive flooring options. You can paint over concrete with oil or latex paints as long as they are designed for floors. 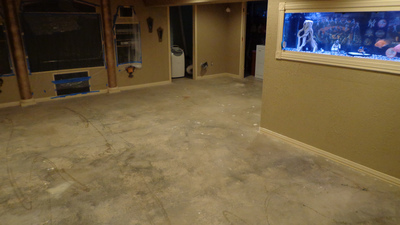 It’s important to note that the paint will not adhere if your concrete floors have already been sealed. Similar to the stamping process, using paint and a stencil can afford all kinds of interesting patterns that imitate tiling or grout. This method is a little more time intensive, but still one of the best cheap basement flooring options over concrete. With stencilling, the stencil is applied to wet concrete and later smoothed with a roller. This method can be used in tandem with stains and colour hardeners to achieve the desired effect. Staining concrete is possibly the most classic way to dress up a concrete floor—and for good reason. The effect can instantly revamp a drab concrete floor into something trendy and stylish. For staining, you will need the stain of your choice, a paint sprayer, a roller, and sealant. Clean your floor thoroughly, and then wet it before applying the stain with the paint sprayer. After waiting for the first layer to cure, you can decide if you would like to build more layers of stain, creating a darker and more vibrant colour. After the stain has achieved your desired effect, apply the sealant with a roller and wait for it to cure. Like painting, staining can also be used with stencilling to create more interesting and intricate effects. When applied on a straight edge, the stain can give the effect of grout. Similarly, a stained floor can be scored with a concrete saw to give the effect of grout lines. If you choose to polish your concrete after this for the most sophisticated effect, you will need several types of concrete polishing tools. The process of polishing concrete requires a specialized concrete grinder, several different discs at different grit sizes, a densifier, and a burnishing pad. Starting with the largest grit and moving to smaller and smaller, grind down your concrete floor. After applying a densifier, switch to a very fine grit, then use a burnishing pad and a sealer.